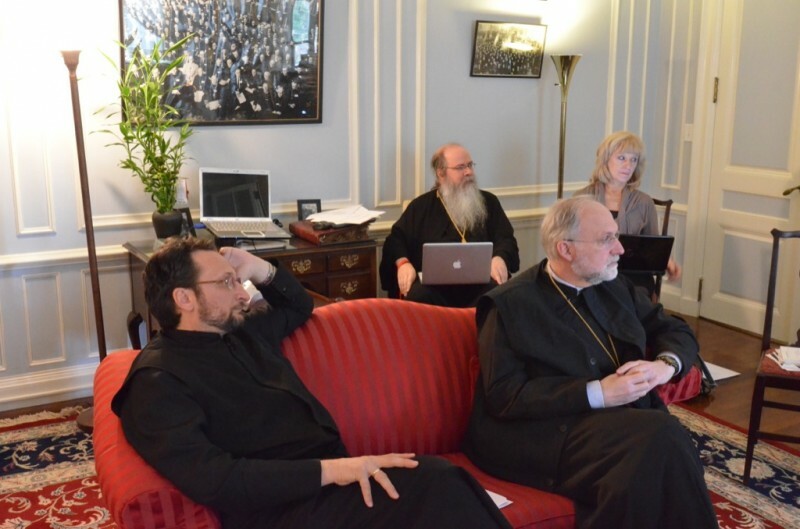 The Preconciliar Commission [PCC], charged with establishing plans for the 18th All-American Council of the Orthodox Church in America [AAC], held its first meeting at the Chancery here Tuesday and Wednesday, December 3-4, 2013. The Council will be held in Atlanta, GA July 20-24, 2015. Members of the PCC, who are appointed by the Holy Synod of Bishops, include His Grace, Bishop Mark [Episcopal Chair]; Archpriest John Jillions, OCA Chancellor; Archpriest Eric G. Tosi, OCA Treasurer and Council Supervisor; Melanie Ringa, OCA Treasurer; Archpriest Myron Manzuk, Council Manager; Peter Ilchuk, Logistics Manager; Archpriest Alexander Fecanin, Local Clergy Chair; Archpriest Leonid Kishkovsky, Chair of the Department of External Affairs; Carol Deerson, Fellowship of Orthodox Christians in America [FOCA[ representative; Elizabeth Mikhailevsky, Metropolitan Council; and Priest Benjamin Tucci, Youth Events Coordinator. According to Father Eric, His Beatitude, Metropolitan Tikhon, attended a number of sessions, during which he directed the PCC to emphasize the spiritual nature of the Council while ensuring that prayer receives a prominent place throughout the Council. He also encouraged a strong participation by the monasteries and the seminaries. Bishop Mark assisted in defining the Synodal directives for the AAC, which include a youth component. The PCC has taken up the theme recommended by the Holy Synod—“How to Expand the Mission.” This was the theme that was first proposed by Saint Tikhon of Moscow, then head of the North American Church, at the First All-American Sobor held March 5-7, 1907, in Mayfield, PA. A summary of that historic gathering may be found here. The AAC will feature a youth component open to children, teens and young adults. Educational programs, trips to various Atlanta-area sites, and service projects will be offered. The youth also will work on a project on the theme and address AAC delegates during a plenary session. The PCC is exploring the possibility of holding an afternoon series of volunteer service projects in the local community, in which delegates will be invited to participate. It is hoped that such projects will leave a lasting impact on the broader community. PCC members see these as ways by which delegates can put their faith into action while witnessing to Orthodox Christianity. The PCC is expecting to implement electronic registration, operation and voting before and during the AAC. All reports will be available for downloading on-line well in advance of the AAC’s opening. “In addition to the theme, the two major initiatives for the AAC will be the OCA Statute and finance reform,” said Father Eric. “A team of Metropolitan Council members, in conjunction with Melanie Ringa and all diocesan chancellors and treasurers, have been working on a new plan for financing the Church in line with directives that emerged at the 16th AAC in Seattle, WA. In addition, a Statute Commission, chaired by His Eminence, Archbishop Nathaniel, has been appointed by the Holy Synod. 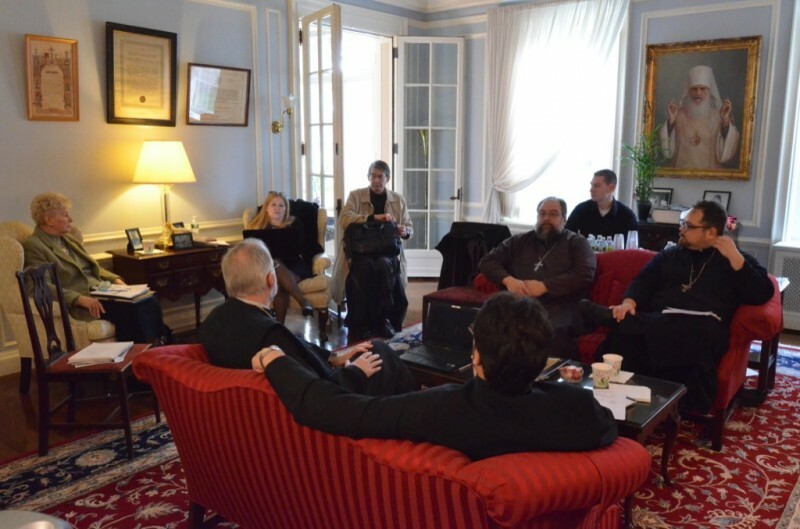 Composed of clergy, laypersons, and canon and civil lawyers, the Commission will begin its work early in 2014. Responsibilities of the PCC may be found here.